NEW MANCHESTER, W.Va. — Through the first five games this season, the Oak Glen softball team has struggled producing runs offensively. The main reason the Golden Bears have been playing well is pitching, with Janaya Montgomery and Maddie McKay leading the way. Montgomery and McKay performed well again against Madonna on Wednesday, but the team needed more than just a run or two. Oak Glen finally came through in the clutch during its 8-3 victory, even when the Blue Dons (0-1) were getting momentum in the fourth inning. The Golden Bears (3-3) held an early 3-0 advantage going into the top of the fourth inning. Madonna’s first three batters reached base safely — thanks to a walk, single and an error — and forced Montgomery out of the circle. McKay replaced her but allowed a one-out RBI single to Jordan Schubert and a two-out, two-run base knock to MiKayla Sole to tie the score. Both hits were jammed bloopers to shallow right field. The Golden Bears responded, however, with a three-run fourth of their own. With two away, Hannah Walker ripped an RBI triple to right-center field. Two batters later, Eileen Flowers delivered a two-run single. 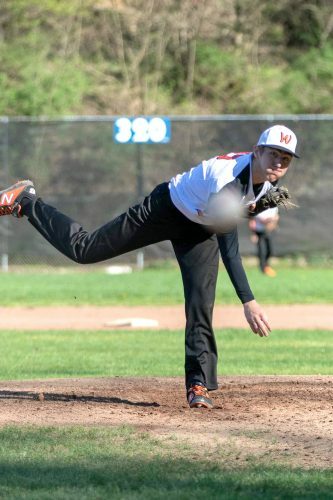 McKay settled down on the mound and only allowed two runners through walks the rest of the way, while striking out eight overall, to pick up the victory. Montgomery allowed three runs on three hits, three walks and no strikeouts. Oak Glen added single runs in the next two frames. Walker recorded her second RBI on a fielder’s choice in the fifth, while Flowers drove home McKay with a single after tripling to lead off the sixth. Both runs came off of reliever Maddie Daugherty. Nina Daugherty made her high school pitching debut for the Blue Dons but took the loss. She pitched four innings, allowing six runs on eight hits, three walks and struck out one. Oak Glen put a dent in the scoreboard first with a two-run second inning. Aiden Hall and McKayla Goodlin produced back-to-back RBI singles, while Amber Moore had one of her own in the third. Wednesday marked the season opener for the Blue Dons, compared to six for their rival. It showed in many ways. Oak Glen is back in action at 5:30 p.m. today, hosting Wheeling Park. Madonna travels to Roane County on Friday. MADONNA (0-1): N. Daugherty (LP, 4IP, 6R (5ER), 8H, 3BB, 1K), M. Daugherty (2IP, 2R (1ER), 2H, 0BB, 1K) and Mir. Sole. OAK GLEN (3-3): Montgomery (3IP, 3R, 3H, 3BB, 0K), McKay (WP, 4IP, 0R, 2H, 2BB, 8K) and Walker. TWO OR MORE HITS: Madonna none; Oak Glen (McKay 2, Flowers 2, Moore 2, Goodlin 2). DOUBLES: none. TRIPLES: Madonna none; Oak Glen 2 (Walker, McKay). HOME RUNS: none. RBIs: Madonna (MiK. Sole 2, Schubert); Oak Glen (Walker 2, Flowers 3, Moore, Hall, Goodlin).